In this research, respondents are presented with sequences of heads and tails derived from flipping a fair coin five times and asked to consider their chances of occurrence. A new iteration of the comparative likelihood task, which maintains the ratio of heads to tails in all of the sequences presented, provides unique insight into individuals? perceptions of randomness and associated probabilities. To develop the aforementioned insight, unconventional interpretations of the sample space, organized according to switches, longest run, and switches and longest run, help situate individuals? answers and justifications within conventional probability. To accurately render the data compiled, an original theoretical framework, entitled the meta-sample-space, will be used with a new method, entitled event-description-alignment, to demonstrate, for the first time, that individuals? 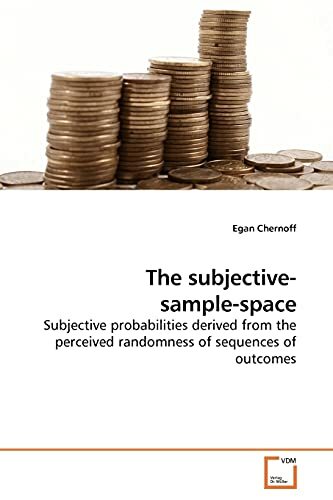 probabilities, derived from the perceived randomness of sequences of outcomes, are in accord with, or model, a subjective-sample-space partitioned according to said individuals? interpretations of the sequence of outcomes they are presented. Egan J Chernoff, currently, is an Assistant Professor of (Secondary) Mathematics Education for the Department of Curriculum Studies in the College of Education at the University of Saskatchewan (Canada).